Exclusive SPILL GUARD Technology-Protects against most liquids, such as-Water, Paint, Mud,&more! Multi-Cutter With an exclusive Dual Edge Guard System the Ram Board Multi-Cutter™ protects flooring from damage and scuffs while cutting. Ergonomic, anti-slip grip handle is designed for comfort and safety. Magnetic closure provides easy access to internal storage of replacement blades. Lays out fast SIZE: 3" x 108'' (72 MM x 33 M) | WEIGHT: 7 OZ. Will the 46 mill ramboard hold up outdoors for a three week project in florida around a swimming pool. also is the 46 mil available at retailers like home depot? Will this product last 8-10 months exposed to the elements such as rain along with construction traffic? To protect a sealer concrete finish from an ordinary remodel construction trades, what "mill" is recommended, 36 or 46? Do you have a representative for the Ram Board in Puerto Rico?...If not, how can I place an order? Can this be used over carpet? It does not list carpeted floor in specifications. Thanks. 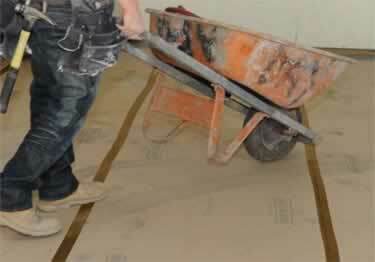 Ram Board has been the number one choice for temporary floor protection in the construction industry. This heavy-duty, Flex-FiberTM reinforced product is engineered to protect new and existing floors from the heavy demands of the jobsite. Designed with cost and efficiency in mind, it lays out fast and is re-usable. Ram board floor protection board was surprisingly easy to unroll and cut to create a path for workmen removing old pipes from a wall. Is holding up well. With the strong blue tape from this site, the ram board can be attached easily to additional pieces of ram boards to cover the portions of floor required. Stays on without leaving residue for up to 14 days. Available in 2 inch x 180 ft rolls, 6 rolls per package.